Many people like to buy things after compare several sellers. The two things look the same, sometimes you don’t know which one is better. Like the pond filter brushes, do you think the two pond filter brushes in the below picture use the same material? I’ve heard many doubts, “Why the similar pond filter brushes have various price differences, for low to high?” I will tell you the truth. Firstly: color of pond filter brushes filament is different. They are all black brush fliament in the above picture, but you can find the color difference after compare them. The pond filter brushes of new PP are pure black, for it is not polluted by impurities. 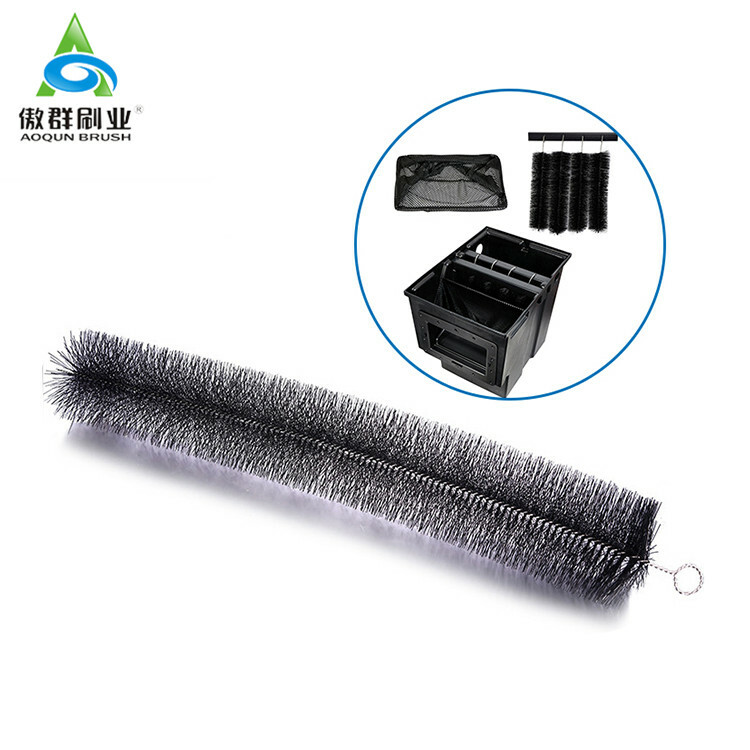 But the pond filter brushes of recycled material are deep grey, not black, for the brush filament has other substances which affect the original black color. Secondly: burrs on the edge of the pond filter brushes filament. After carefully observe the difference between the pond filter brushes in the below picture. You can see the brush sample on the right, which has many uncut burrs with rough cutting. However, the AOQUN pond filter brushes are bundle cutting by advanced machine, so it has neat cutting edge without burrs. If you use the pond filter brushes with burrs in the pond for hanging fry, the burrs will hurt the fish and fish fries. Thirdly: the difference between the tensile. We have done the same tensile test for these two pond filter brushes. We chose 5-10 brush filament from the pond filter brushes and pull it. As you can see in the below picture, the pond filter brushes on the left can be easily pulled out the brush filament, but AOQUN pond filter brushes filament cannot be pulled out even when the stainless steel rods are bend. 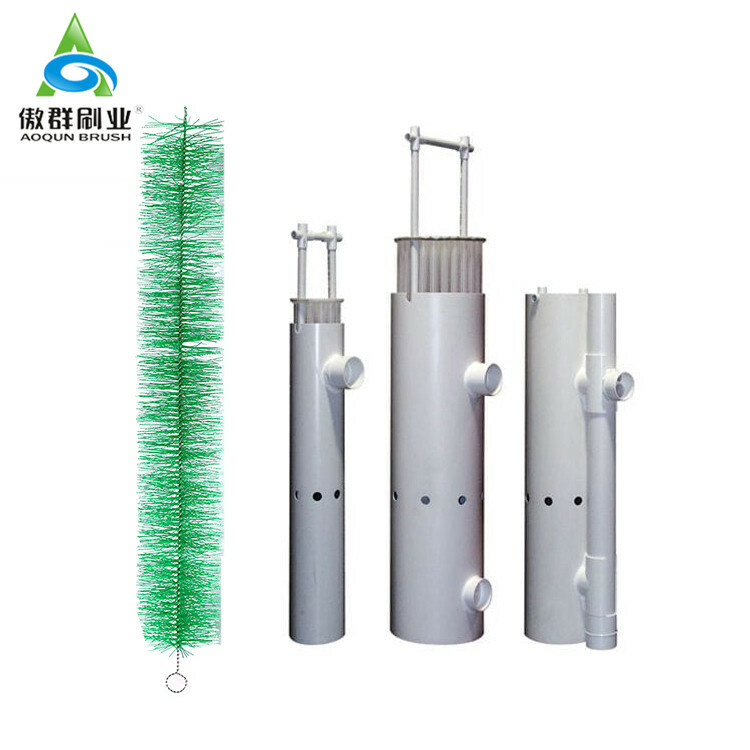 It indicates that our pond filter brushes can break through the water flushing, hang up more biofilm without brush filament lose, thus it will not affect the filtration effect. Though they look the same but have much differences. Dare you use the bad quality pond filter brushes as below mentioned? AOQUN only make the high quality pond filter brushes with pure PP, bright color, no impurities, do no harm to your fish pond with long term service life. The septic systems work in anaerobic or anaerobic environments, promoting the growth of a black muddy layer called biological mat in a drainage yard. Over time, the biological mat accumulated and seal the floor and sidewalls of the drainage area, preventing it from absorbing water discharged from the septic tank. This has led to septic system breakdown, including stagnant water, bad odors, the toilet and drainage are not smooth, tank water overflow and more. So we need to do a good repair and maintenance of septic tank system. It is very necessary to introduce septic tank cleaner brushes for you, which are made of curved PET brush filament and stainless steel shaft. The septic tank cleaner brushes can be very good filter for the toilet papers, hairs, lints, etc. It has a variety of sizes to your choice from 4 ", 6", 7 " or 8", durable and easy to install, which can be used immediately after brought home. You can fix your system faster and provide more protection against the ingress of solids into the drainage area at the same time when you use the septic tank cleaner brushes!